Meet the Ajinaku’s. These beautiful scholars have endured so much and continue to shine like stars. In 2010 the eldest 2 children attended Kilombo in the kindergarten and first grade, but abruptly moved to Denver after family turmoil. 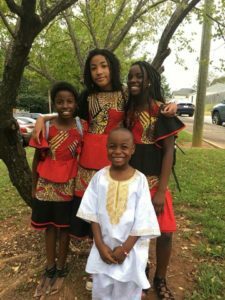 After their academic foundation at Kilombo they were skipped in Denver, but with several bad experiences in the Denver school systems. In 2016 when Ojo, the youngest brother, started school in Denver he was bullied and labelled “overactive”. There mother decided she had to save her children and move back to Atlanta in order for her children to attend Kilombo and continue their academic experience in a safe, African centered, and academically rigorous environment. A single mother of four made a way to give her children what they needed. In a devastating turn of events to children lost their father. The trauma of the loss greatly effected the children and our entire school community. As a community we are committed to coming together to keep the children in a stable and loving environment in spite of their loss. We were blessed to graduate Monye, the eldest child, in 2018. In 2019 we pray to graduate Modupe (the second born), and in 2022 we have to graduate Aina (the third born), and in 2025 Ojo. Help us support the Ajinaku family and donate to their Adopt a Scholar scholarship today!